…or at least, feel like you look awesome while doing it? Thank you so much for voting me into Project Food Blog Round 7 — I’m so grateful for your support! Challenge #7 was to create a video tutorial. I think you guys know by now that I’m a little obsessed with souped–up cheesecakes, so without further ado (okay, with a little more further ado), I’m about to show you how to create flippin’ awesome cheesecakes. What went into creating this video? Lots and lots of planning — dozens of pages worth! Lots and lots of time — 35+ hours worth! And lots and lots of fun — probably more than I should’ve had. Ahem. You’ll see. Cheesecakes are incredibly customizable. In the video below, I’ll show you 3 different crusts, 3 different fillings, and 3 different toppings. By mixing and matching these components, you can feasibly create over 27 different cheesecakes! So, um, if you ever need 27 different cheesecakes . . . I got ya covered. Enough of the suspense! What do you get when you combine stop-motion animation, a music video, some ridiculousness, and a whole lotta cheesecake? Watch and see. 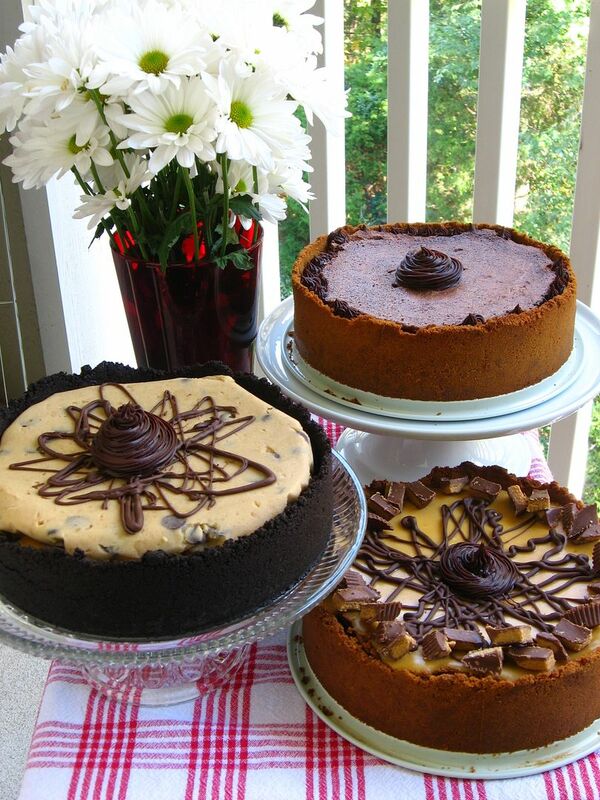 You can print the recipes for these cheesecakes here: Coffee Cookie Dough Fudge Cheesecake, Caramel Fudge Brownie Cheesecake, Chocolate Peanut Butter Bliss Cheesecake. …wherein I prove that I’m basically tone deaf, drop my brownie layer in the floor, yell a lot at my piece-of-crap hand mixer, and eat bacon. After the video camera was tucked away, the tripods were folded up, and my smudgy lipstick had faded, there was still one itty bitty order of business to attend to. What the heck does one do with three cheesecakes?! Turns out there was something awesome to do with them! My friend Carol has a heart the size of Jupiter. She’s worked with children with special needs for several years now, and recently, while browsing Reece’s Rainbow, a website that connects orphans with special needs to adoptive homes, she laid eyes on Quinton. Quinton is a tiny, precious baby boy in Eastern Europe with Downs Syndrome. At first, Carol half-jokingly asked her husband if they could adopt him. As time went on, though, it became clear that neither she nor her husband could stop thinking about Quinton. They posted his picture on her refrigerator and decided they were going for it. They’re currently beginning the process to bring him home! This miracle is not without a cost — it will take thousands of dollars. I decided my huge, decadent cheesecakes were perfect for a little fundraising. I gave two of them away in return for donations to Quinton’s fund. I can’t tell you what an honor it is to be a tiny part of Carol’s journey — and how humbling it is to see other friends donating their time, goods, services, energy, and love to them! Little Quinton is already changing our lives. Would you like to help as well? You can see Quinton and donate to his adoption fund here. A big thank you to: ALL Willow Bird Baking readers who have been so supportive, Sarah for the use of her camera, Kim for loaning me a second tripod, Byrd for being willing to hang out with me while I edited video for about a decade, Royalty-Free Music, Carol for already being an amazing mommy even though her little one is still across the world, my 7th grade students for inspiring my stop-motion animation, and everyone who helped me eat cheesecake! P.S. – Did you have a chance to see my Teaser Video? P.S. 2 – Dear Coworkers, if you make fun of me about this, no more cheesecake for you! I haven’t watch the official vid yet, but I’m already laughing out loud at the mixer standing beside the bowl whirring away while you took a break. Sometimes small appliances develop minds of their own! Wow, you did such a great job with this…Seriously – great job! The bloopers wheel was a cute touch. Congrats on your friends and their adoption. Good luck! Will definitely vote. Great video! It is obvious that a lot of time, sweat and vocal chords were put into it! p.s. good job on the appearance of the dog! THANKS, Ethan! LOL – I knew you would appreciate that! Love your video! Also love how you raised money for little Quinton – he’s super cute!! This was SO fun! I loved it. I want to go home right now (I’m at work so it probably woulnd’t go over so well) and make cheesecake!!! You are adorable! Love the video! Now you’ve got me craving cheesecake for breakfast. Good luck, I’ll definitely be voting for you when it opens! I love it! The cheesecakes look amazing as usual and I’m so glad to finally see how you do it! I absolutely love everything about your video (including the blooper reel). Fantastic job!!! Fantastic job as usual Julie, this is a very clever video! How adorable!!! I love this and you are SO CUTE!!! Thank you so much, Mara!!! Your video is great. I cannot wait to show it to my class. Very informative! Good luck! Thank you!! Hope your class has fun with it. Love cheesecakes, and I know they could come up with some amazing ones — they’re always so creative! this is SO awesome – I love it in every way – not just because cheesecake is my absolute favorite! yours look fabulous. you are funny and fun, and I want to come hang out in your kitchen! <3 you totally have my vote! I want you to come hang out in my kitchen too! 😀 Thank you, love! Love love love these! you are super cute and super funny and now I just want to go in the kitchen and bake 27 cheesecakes. Seriously. DO IT!! 😀 Thank you, Joanne! Lew and I just made our fist stop on the way to the foodbuzz festival. We dropped our twins off at the grandparents and are now on the way to Nashville fly out in the morning. We look forward to meeting you in San Fransisco. LOL I love it! Can Katherine Heigl PLEASE play me?! 🙂 Thank you, Lorraine! Awesome video! It’s clear that A LOT of work went into this!!! Love the bloopers. Julie! You are so adorable and friendly but not in an overly cheesy annoying way (you know what I’m talking about). I know you put a lot of work into that 6 1/2 min. video but it was so good! You should really consider doing these much more often (like once a month, including blooper reels). Besides having fun watching you I learned something! You really have a great camera presence! This wasn’t at all painful to watch like some other vid’s on food buzz…… omg would rather watch paint dry while having a root canal performed by my hairdresser! Ouch! The camera loves you “dahling”!!! P.S. I have a small blender that is possessed and has to have an exorcism performed on it every 4th or 5th use! It’ll speed up, then slow down and make a growling noise and then it will not let you turn it off all on it’s own. The mixer running on it’s own was hilarious! LOL — what is it about those smaller appliances?! I love the possessed-mixers/blenders/processors stories. How TOTALLY sweet you are, Robin!! Thank you so much!! This was a super cute video and really informative! I love the bloopers too. Kudos! Your hard work payed off! Great job! Your blopers made me laugh a LOT! I’ll be back on Monday to place my vote. Aw, thank you so much Mary!! finally watched your video, amazing work. also, you made the most amazing cheesecakes i have ever seen. can we be friends?! YES times a billion 😀 Thank you! Oh my goodness, the blooper reel had me cracking up. And I love love loved your video! Aside from being really entertaining to watch, I learned a lot. Cheesecake is one of my favorite desserts to eat, but every single time I try making one, something goes dreadfully, tragically wrong. You’ve inspired me to give it another go! Oh my gosh!!! This is awesome! It looks like you had a lot of fun making it (minus the dysfunctional mixer :P) , too. My boyfriend watched this with me and is totally ready to dump me for you and your cheesecakes skills, by the way. LOL!! Perhaps he just needs to look back at your apple pie post to remember himself. 😉 Too funny. Thanks, Kaitlin! I love you(r videos, if that’s less creepy). You must be a fabulous teacher! Congratulations on progressing so far! Your cheesecakes are over-the-top gorgeous. And I loved your bloopers! Julie you are so cute! Love your sense of humour approach to baking and your blooper reel had me in stitches. Hi Julie! It was so nice meeting you at the photography class this weekend! Your demo was great, too! Nice to meet a fellow Christian blogger 🙂 And Southern too to boot! Aw, so wish we could’ve hung out even more! It was great to meet you too — and I love meeting other Christian bloggers as well. We need to stay in touch! Oh wow, you are pretty amazing, making all those cheesecakes! It was great meeting you at FoodBuzz this weekend. It was nice putting the face and person to the amazing recipes and food! Thanks so much, Astrid! It was wonderful to meet you too! I found you! I’ll have pictures from our hunt edited soon. One the bar tender took is blurry, but it will work for what we need. If you’d like them please email me at laurajeanne25 at yahoo dot com. I hope you got home safely! Perfect for a bake sale. Little Quinton is so lucky! Thank you, Naomi! He has a wonderful mommy and daddy already!! You are so cute! This was fun to watch! OMG this is hilarious!! So nice to meet you this weekend! Totally voting once it’s open!! Hurray! Thanks, Stephanie 🙂 Nice to meet you, too! We just made our very first cheesecake… pumpkin with graham cracker crust… in the pressure cooker!! At first it was a little underdone (because I fail at reading recipes) but it was still awesome. Oh, TOO AWESOME, Leslie!!! PRESSURE COOKER CHEESECAKE! Now that’s creativity! Hi Julie!! I just saw your video (and the blooper reel which was hilarious btw) – and I loved it! I actually have never made cheesecake before but you totally inspired me to try and do it. Your video is soo cute and really clear and helpful. Once voting opens up I’m totally going to vote for you! Hope you’re having a good week! HURRAY!!! You should go for it! Cheesecakes are a lot of bang for your buck in the “impress your family” department 🙂 Thank you so much, Anjali! Hope your week is going well too! You are awesome. I LOVE IT!! SO happy to vote for you!!!! Yikes Julie I already lost your email. Sighh.. I need a better brain. Anyway the post is up with your pictures in them. I already knew you were cute. Hello, I met you in PERSON! Lucky me! But this video just made me miss you…I wish I had gotten more time to hang out with you! Love it Julie! Nice meeting you at the festival and good luck. Thanks Lisa! It was great to meet you, too! I just finished uploading some photos from the Foodbuzz Festival in San Francisco. I was happy to meet your smiling and friendly face– I’m Monica’s friend from “Lick the Bowl Good”. Good for you for making this video! It was entertaining, but I love the idea of adding a ganache layer to cheesecake. That is so inspiring! Good luck on making it to the next round. Great job! You have such a great personality and it definitely showed in the video(s). Great fun! Thank you so much, Joan!! AH! I loved it! I thought I would hate this round but I can’t get enough of it. You are so funny. Your editing is hilarious. Genius of you to put a ganache layer, too. Best of luck my dear. Your cheescakes look awesome! funny, adorable and well-executed: three perfect ingredients! Wow!! So impressed. You can tell how much time you put into this with all of the different varieties and photos you took of the step by step layering at the end. Great job!!! The funniest video out there. Awesome. You got my vote. Super cute video. After watching I feel that I might be able to make a cheesecake. Good luck! You can totally do it, Kristen! 😀 Thank you! Your video was great!!!! And you made such a daunting task look flawless! Great job lady I vote for u! So great to meet you too 😀 Thank you! Is there anything better than a nutter butter crust? I think not! How come we didn’t get to hear your fabulous vocal stylings at Foodbuzz? You could have provided your own music for that dance. Hmm . . . Good luck on PFB, lady. Congrats on making it this far! I absolutely adore cheesecake… YUM. Sending a little red heart your way. Good luck. Hi Julie – that was simply terrific! I’ve never made a cheesecake, but sure am tempted to now. Love your style. Good luck in the challenge! Are you thinking about baking something with pumpkin – I hope so!! AWESOME! AWESOME! AWESOME! Loved the video and your cheesecakes are devine! My vote has been cast! Aw, thank you so much, Anne!! Well done lovely, you’re doing great in PFB! Good luck for this round! Thanks so much, Jackie! Your video was masterful — SO funny! Your video is informative, fun and yummy! Great job! I love cheesecakes. Perhaps even 27 of them. Informative and hilarious. Nice job! What a fan base you have here. Already loved you in the voting, but coming back to tell ya so here. Great video; really wonderful way to get across a lot of info and you’re adorable! One of the earliest videos I saw – you cracked me up with the tone-deaf singing. Love it, mostly because I don’t live next door to you ; ) Your video looks really natural and fun. Great job! Vote’s in. Good luck! LOL, thanks Heena 🙂 I loved your video as well! Thanks so much, David! Photography’s always a challenge for me, so I really appreciate it. I realize I probably have said this too much whilst watching your amazing food rise to the top, but you’re amazing! I want to be just like you when I grow up. That is so awesome Ms.Ruble! I loved it! You are TOTALLY going to win! If you don’t then the judges are totally lame. This is such a great post. Loved the video, it was so much fun. I’d already voted for you earlier, only got around to reading the entire post now. Excellent video…I think of the PFB videos, I learned the most from this. 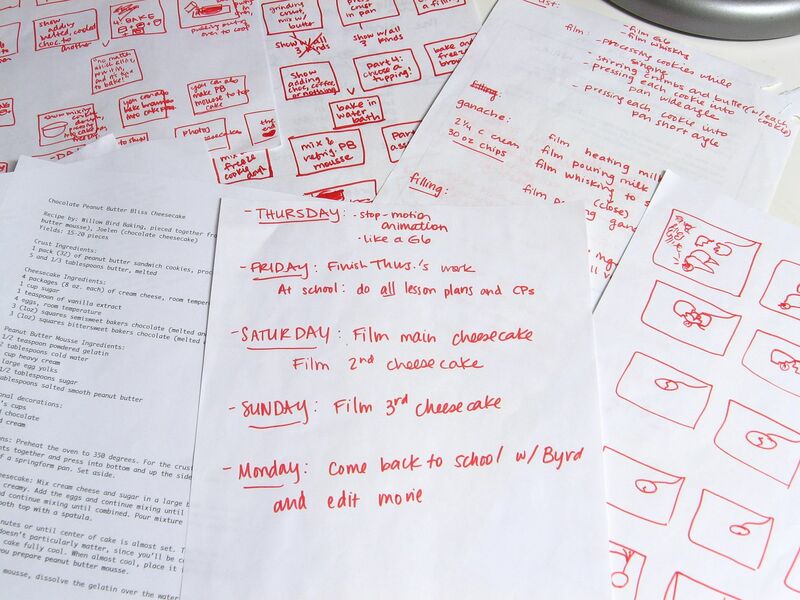 You’ve totally demystified cheesecake making in this professional masterpiece! I know there’s a lot more to this whole post…but…wow…you’re really pretty. I just wanted you to know that. Aw, Pam! That is so sweet! Thank you! I just found your web site. LOVE IT! Question about the ganache layer: does that help keep the crust crispy? I just made this cheesecake with the oreo cookie crust and Ganache chocolate layer. After baking and cooling over night. I then topped it with raspberry glaze and raspberries. I took it to my ladies group last night. Perfect Valentines desert, and was it ever AMAZING! Don’t be afraid to add this layer. I received so many compliments on this beauty. I did need to increase my baking time 15 mintes, because the crust layers were frozen when I added the filling layer and placed in water bath to bake. Julie, you are now my ” go to girl” when I want something elegant. THANK YOU. thank you, thank YOU! So beautiful and tasty desert lady.